Yesterday’s article, Vaccines Do Irreparable Harm: Study from Poland, documents the revealing information brought out by Polish scientists’ review of the scientific literature on vaccination’s adverse effects and immune system effects. Today, the rest of the study covering neurological symptoms following vaccination and a history of vaccines demonstrating little benefit is reviewed. The authors focused primarily on the preservative thimerosal’s active ingredient, mercury, in their discussion of vaccine-induced neurological damages. They noted that the percentage of people who have allergic reactions to thimerosal has been calculated at a low of 13% in the Netherlands to a high of 21% in Austria. Allergic responses to mercury are often initially triggered by vaccine injections. It’s noted for toxicity to the heart, liver, kidneys, and nervous system, along with being a carcinogen. Readers of Gaia Health are probably aware that much current research on vaccine adjuvants indicates that aluminum may be the greatest concern. The reduced mercury load in the United States’ vaccines did reduce the autism burden for a short time in the US. However, a great number of vaccines was added to the schedule shortly after, and many of them included aluminum as an adjuvant, thus increasing the autism burden. Epidemiological research has shown a direct relationship between increasing doses of thimerosal and the rate of autism in the US from the late ’80s through the mid ’90s. They found a correlation between the number of measles-containing vaccines and autism prevalence during the ’80s. The same researchers also found odds ratios that were statistically significant, indicating that increasing doses of mercury from vaccines with thimerosal correlate to increasing rates of autism. Note: Not included in the review is the fact that Poland’s vaccination schedule is mandatory. Notice that all but one of the vaccines listed above are made in Poland. It’s one way to assure profits for the home-grown pharmaceutical industry! They are reports from Germany showing, on the left, the number of TB mortalities from 1956-1988, and on the right, the number of reported cases from 1949-1987. The BCG vaccine against TB was introduced in 1970. (The area in the rectangles represents the total number of vaccinations given during the decade from 1970-1980.) It matters not whether you take a quick look or a long one, it’s obvious that the TB vaccination had absolutely nothing to do with the reduction in either cases of TB or deaths from it. 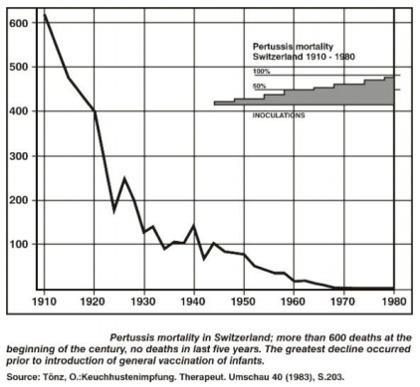 The graph above shows the pertussis mortality rate in Switzerland from 1910-1980. 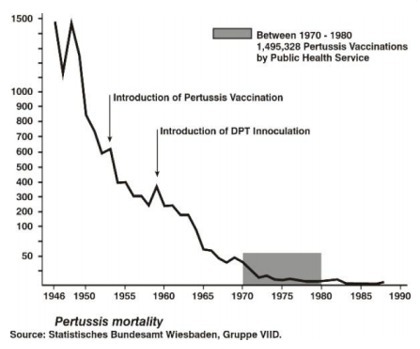 The shaded area (at the top right of the graph) shows the introductory date of the pertussis vaccine in 1944, and shows how that vaccine’s coverage increased to nearly 100% by 1980. However, it is not possible to see any change in the trajectory of reduced pertussis deaths. On looking at these graphs, how seriously can we take claims that vaccines have saved lives? 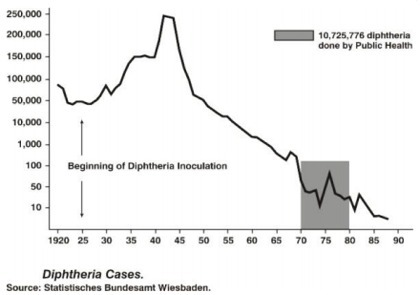 We can’t see any improvement in either mortality or number of cases before and after vaccinations were initiated—and in the case of diphtheria, it certainly looks like vaccinating aggravated the rate of disease! … Thus results from this review demonstrate that there is a continued, measurable, positive effect of personal and community hygiene on infections. So, we’re back to the precautionary principle, something that should have been applied decades ago. It’s difficult to imagine the massive amount of harm that’s been brought to generations of children, with each succeeding one suffering worse than the last. Will those in power ever listen to reason, or will they continue to be led around by their greed, leaving our children and future generations to suffer? Do they really believe that society can continue to function when most people are chronically ill?